*In some cases the “Year New” is a guess based on when the station went on the air. Before you write me and say “But model XYZ transmitter wasn’t made until 19XX, I did not look at every name plate and write all the information down as I did this. Like everything else, there is a process to this. 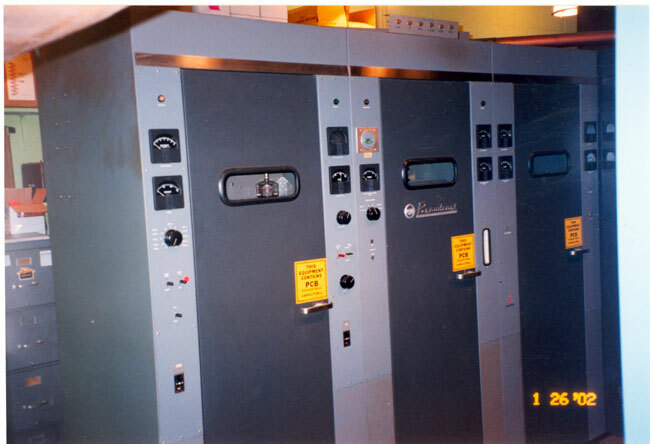 First of all, if the transmitter was made before 1978, the possibility of PCB capacitors and transformers exists. In the case of the GE BT25A, massive amounts of PCBs needed to be disposed of properly. According to current federal laws, ownership of PCBs and PCB contaminated items cannot be transferred. Thus, the transformer casings were cleaned out and taken to Buffalo to be buried in a PCB certified landfill. Otherwise, most other transmitters, such as the RCA BTA-10, may have a few PCB capacitors in them and perhaps the modulation transformer. Those items can be disposed of by calling an authorized environmental disposal company like Clean Harbors. The rest of the transmitter is stripped of any useful parts. Things like vacuum variable capacitors, rectifier stacks, blower motors (if they are in good condition), HV power supply contactors, unique tuning parts, whole control and metering boards, tube sockets, etc. The remaining carcase is then disassembled and hauled off. I got a guy that will do this for relatively little money. He takes the transmitter back to his warehouse and cuts it up, sorts all of the various metals out, then takes it to the scrap yard. This includes things like cutting all of the windings off of transformers and power supply chokes, sorting out the brass and copper tuning parts, etc.